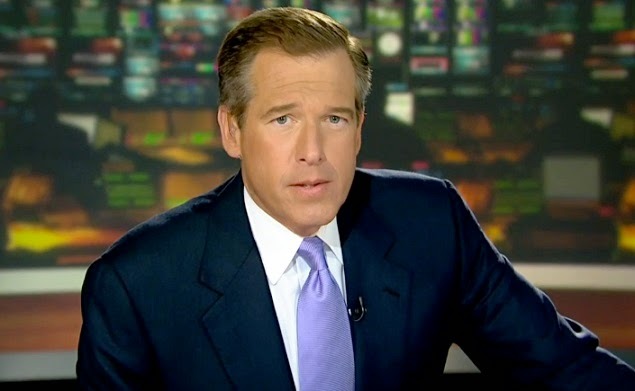 Brian Williams’ suspension as the NBC Nightly News anchor, for allegedly misrepresenting his experiences in a war zone in Iraq, is a case-in-point of the savagery with which we devour our own in present day America. Williams is (or was, the outcome yet to be determined) a first-rate news anchor. Recipient of a Peabody Award for coverage of Hurricane Katrina, Vanity Fair said Williams' work on Katrina was "Murrow-worthy," a reference to the gold standard of journalism, Edward R. Murrow. In 2007, Time named Williams one of the 100 most influential people in the world. During the ten years he anchored the news segment, Williams picked up 12 News & Documentary Emmy Awards for NBC. For the past six of his ten years behind the NBC desk, Williams has led the three major networks in ratings. Was he or was he not actually shot at and was his helicopter hit by enemy fire? It seems not. Events as well as memories get fuzzy over time. Did John Kennedy actually hang out with Mafia boss Sam Giancana and his Rat-Pack buddies while on vacation in Florida or did he not? It seems he did. In any event, the media itself went into feeding-frenzy over one of their own, devouring Brian Williams. Has the American media become a kennel floor? There was a time when we had better sense, a time when we had manners, our focus elsewhere and the plain graciousness to avert our eyes. Eisenhower’s wartime liaison with his female driver comes to mind, as well as Harry Truman’s Kansas City machine-politics connections, John Kennedy’s whore-house White House and yes, even Ed Murrow’s ever-present cigarette while on camera. When I was a kid, we knew (but never mentioned) that FDR was crippled by polio. Who among us hasn’t a flaw somewhere in their past? Flaws are what make us human and, more than that, valuable to society. The flawed man or woman is one who has lived a full life and gained experiences from that life worth teaching. One does not learn much from success, but great men have more often than not overcome failure and ridicule. The fallout of penny-ante savagery is an unwillingness to put ourselves forward into the national or even local spotlight and we as a nation are the poorer for it. Does anyone really believe that the current contenders for the presidency are the best America has to offer? If NBC fails to give Brian Williams a hand up from the kennel floor (with an apology and vote of confidence) we will have lost another of the best America has to offer and yes, we will be the poorer for that as well.